Should a foreign language be taught in all middle schools? “For millions of years, mankind lived just like the animals. Then something happened which unleashed the power of our imagination. We learned to talk and we learned to listen.” -Stephen Hawking, 1993. English, Spanish, French, German; The list can go on and on. Languages are a way that humans share their feelings, desires, thoughts, and ideas with one another. A foreign language is a language that didn’t originate from the same place as the speaker. Someone from Spain can say that English is a foreign language to them. In 2008, high schools in America started teaching their students a foreign language due to the many advantages that it held. However, should all middle school students be given this opportunity too? In the article called, “Is learning a foreign language necessary for a high school education?” by Casey Miller, learning a foreign language is required in high school in order to get a four-year college education in America. However, in America, middle school students don’t have any requirement for learning a foreign language. 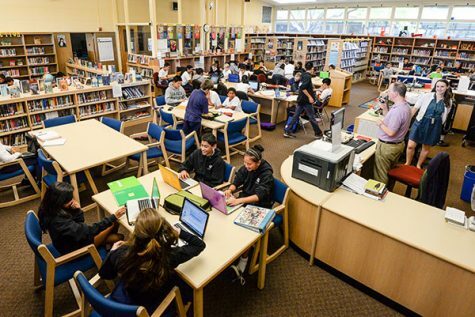 Despite this, middle schools including Peterson Middle School, located in Sunnyvale California, have a seperate elective class where students can learn languages such as Spanish and Japanese. Being able to communicate with different people in different countries makes it easy to convey thoughts and ideas with other people. As reported by Cornell University, studying a foreign language at a young age can often be easier and not feel as complex. Learning a foreign language can give an adolescent’s brain a mental workout and help the child develop. Aolani Rodriguez, who also attends AdVenture/STEM at Herman Intermediate, was also interviewed about this topic. “It would be cool to have an option to learn a foreign language because if you know other languages besides your own, it can lead to many job opportunities. Personally, I don’t think it would add to much stress for me to learn a foreign language in middle school. However, it really depends on how rigorous the course would be,” she replied. As technology continues to advance and international travel becomes more popular, learning a foreign language can result in meeting different people and experiencing new things. Languages are one of the major ways that humans all communicate with each other and express themselves. Knowing foreign languages can sharpen minds and increase brain power. Whether someone learns a foreign language in middle school, high school, or even as an adult, it can open up countless opportunities. All in all, due to the vast amount of languages, humans were able to cooperate with each other thousands of years ago and can still do today. Nicely written article! I really like how you included quotes from other articles that talked about this topic. I like how you included why learning another language can help people. The article is definitely well written but I would removed the “was also interviewed” part and find a different way to introduce the people you interviewed. I agree, I think Foreign Languages should be taught in Middle School. It would help later when we have to learn it in High School. I love the article, and I like how you started the article with a quote, really nice. This article was nicely written and I completely enjoyed reading. I found if very interesting and well written, I liked how you decided to start your article with a quote, and included many other quotes in the article, quotes from different articles, writing about the same topic. I liked how you gave examples of a middle school that has separate classes that you can learn Spanish or Japanese. Is Fortnite taking over kids lives? What do you think the meaning of life is?